The prison in this photo is based on a design by the philosopher Jeremy Bentham called the panopticon. In this prison, there is a single point in the center from which any of the prison cells can be seen. Every prisoner is under constant surveillance as the prisoner could be observed by the guard in the center at any point in time. 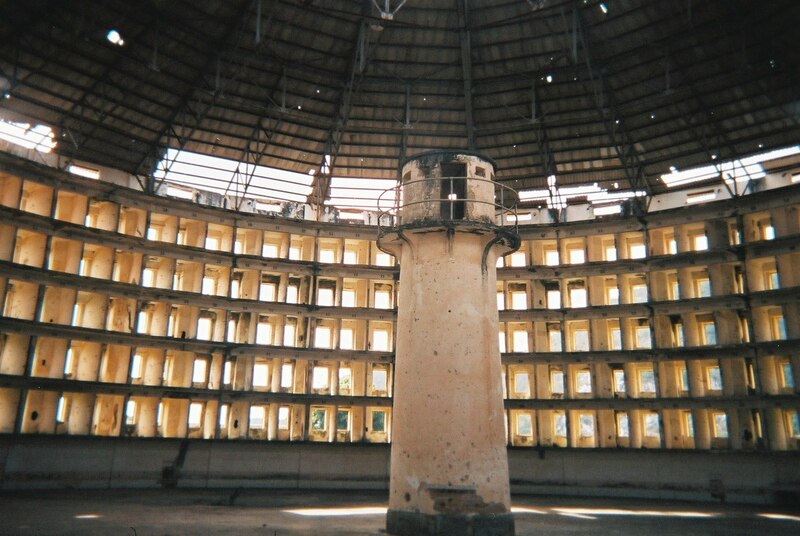 The idea of the panopticon and any system of surveillance is not to catch a prisoner in the act of doing something “wrong”, but rather to make every prisoner feel that since every action is being observed, you can never engage in a “wrong” act without being seen and at some point punished. 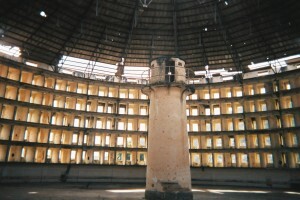 Ihe panopticon through surveillance effectively creates the rules of the prison in the prisoners’ minds. If a prisoner is not supposed to rub the top of his head, he will upon raising his hand think, I may be observed, I had better not rub the top of my head. While initially causing conscious self-censorship, over time the rules will become a sub-conscious part of the his mind in the same way we automatically say “thank you” upon receiving change. While Bentham’s goal was to create “a mill for grinding rogues honest”, systems of government surveillance are invariably abused by those in power to retain power. J Edgar Hoover used a system of surveillance to remain head of the U.S.’s FBI for 37 years. He had such extensive incriminating knowledge about so many government officials, no elected politician could remove him or even constrain him. Only death did. The internet is the most free medium for the exchange of ideas and for associating with other people that humanity has ever had. Without privacy, that room to explore without being judged or monitored, we don’t have freedom. The purpose of a system of surveillance is like the panopticon to create prisons — prisons in our minds. A “prison” in which some thoughts and ideas are effectively self-censored as unacceptable. A “prison” which stops us from investigating or associating with certain people or groups which our government or even neighbors and friends don’t approve. Without online privacy, we don’t have a free internet. If you know your searches and browsing history are being monitored by the government, by your employer, by other organizations, then you won’t search certain things, visit certain websites, or explore ideas with certain people or organizations. Undesirable thoughts may be investigating corruption by your government’s leaders or accessing the policy statement of a supposed enemy of your state. There are any number of ideas, activities, people, and actions which a government may monitor and try to suppress. Historically in one of the freest nations on our planet, the United States, surveillance has been initiated on Americas who protested for civil rights for all citizens, who opposed certain wars, who had sympathies for alternative economic systems, and who associated with people from certain countries or organizations. There are dozens of books which at various times have been banned in the United States as representing some sort of a threat including the now-classic novels Ulysses and Catch-22 to documents that revealed truths of misrepresented government activities to the public. To understand what sort of a state and world we would live in if government surveillance were to be the norm, you can read the now-classic novel 1984. It’s remarkably prescient and the best-known account of a surveillance state. The Lives of Others is a recent film about the East German surveillance organization the Stasi. There are many other films and novels which have imagined what has come to be called an Orwellian world in which government “thought control” of its citizens is achieved through a system of surveillance. When you use Epic, you protect your freedom to think, to associate, and to investigate. You’re keeping your mind free of any prison except that of openness and curiosity to all people and thought. We’re thrilled and so proud to protect a free internet for hundreds of thousands of users every single day all over the world.